Cxense Insight is a tool that shows your business how your website’s users consume content online in real time so your company can provide a better user experience for them and result in higher digital revenue. The tool captures all relevant traffic as well as events across desktop, tablet, as well as mobile devices, and display the relevant information in intuitive dashboards. 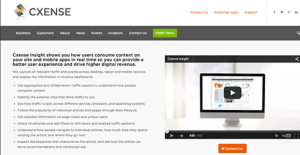 Cxense offers intuitive real-time dashboards for your editorial teams. The critical business information that you need will be presented in a very visually compelling manner to allow your business to monitor and take decisive action. You can also leverage standard wallboards that can support common scenarios or even make custom versions to match your needs. Cxense Insight’s free trial packages suit businesses of various sizes. Cxense Insight shows companies how their users consume content on their websites, real time so they can provide a better user experience and result in higher digital revenue. With this tool, you can get aggregated and drilled-down traffic reports to help you better understand how people consume content. You can identify the external websites that drive traffic to your company’s site. You can analyze how traffic can be split across different browsers, devices, and operating systems. Cxense Insight allows you to track the popularity of your website’s individual articles and pages. Get detailed business information on your page views and unique users. In addition, you can pick timeframes and add filters to further drill down and analyze your website’s traffic patterns. Understand better how people navigate to your individual articles, the time spent reading the articles, and where they usually go next. Cxense Insight provides top rate real-time analytics through customizable dashboards for web and mobile sites, as well as mobile apps. By analyzing the content on each page of a site, and tracking every user interaction across all devices, Cxense Insight provides a detailed and rich real-time web analytics platform. Businesses use the solution to continuously improve their digital user experience, boosting user engagement and revenues. Cxense Insight works in harmony with Cxense DMP (Data Management Platform) and other Cxense solutions to help businesses gather, segment and action data. What Problems Will Cxense Insight Solve? Publishers use Cxense Insight to get real-time updates on their websites, mobile sites and mobile apps. This includes how users are interacting with their site, where traffic is coming from, what is popular on social and which stories should be moved to the front page. Dashboards are customizable so each department can see the metrics that matter to them. Retailers can track in real-time which products are trending, and which segment of the audience are interested in various products and content. They can also find out which products to promote in other channels based on popularity and audience engagement. It's essential to note that almost no service in the Business Intelligence Software category is an ideal solution able to meet all the requirements of all company types, sizes and industries. It may be a good idea to read a few Cxense Insight reviews first as some software may excel exclusively in a very narrow group of applications or be designed with a very specific industry in mind. Others can function with an intention of being simple and intuitive and therefore lack advanced functions needed by more experienced users. You can also come across apps that support a broad group of users and offer a rich feature toolbox, but that frequently comes at a higher price of such a solution. Ensure you're aware of your needs so that you select a solution that offers specifically the features you look for. How Much Does Cxense Insight Cost? We realize that when you make a decision to buy Conversion Rate Optimization Software it’s important not only to see how experts evaluate it in their reviews, but also to find out if the real people and companies that buy it are actually satisfied with the product. That’s why we’ve created our behavior-based Customer Satisfaction Algorithm™ that gathers customer reviews, comments and Cxense Insight reviews across a wide range of social media sites. The data is then presented in an easy to digest form showing how many people had positive and negative experience with Cxense Insight. With that information at hand you should be equipped to make an informed buying decision that you won’t regret. What are Cxense Insight pricing details? What integrations are available for Cxense Insight? Cxense Insight works in harmony with all other Cxense products (Cxense DMP, Cxense Content, Cxense Advertising, Cxense Search) as well as all content management systems (CMS).